Few baits will ever be as successful as the plain lead-head jig. As a bait-delivery method or a stand-alone option, it excels for multiple species throughout the country, moving water or stagnant, stained or clear. It can be swam, hopped, plopped, dropped, dragged, shook, pitched, and fished vertically, among other presentations. No matter how you choose to fish it, there’s a species that’ll eat it on every water body near you. However, that doesn’t mean it’s necessarily easy to fish, and it can be downright challenging if you’ve never been much for jig-fishing. I learned to fish jigs on a river system in current, which is quite the curveball compared to natural lakes. With moving water, you need to take into account more variables like sweep, casting angle, mono vs. braid, among others. However, with a few pointers, anyone can catch fish with jigs. Here’s a few to get you started in the right direction. Use the Right Tools for the Job – Start with a lightweight, high-quality carbon-fiber (no fiberglass) rod in an Extra Fast (XF) action, along with a featherweight reel combination. Jig-fishing, perhaps more than any other technique relies heavily on feel, and you simply can’t feel much with poor equipment. While there are techniques that don’t require you to spend as much on a rod and reel, here’s one instance where you really get what you pay for, and better tech quite simply leads to more fish. Line – Start with braid and a fluorocarbon leader of a few feet in length, joined by an Albright Special or Uni-to-Uni knot. This offers you the best ability to feel the jig, while still having some stealth with the nearly translucent fluorocarbon line up against the jig itself. Mono can excel in certain situations, especially in current where the sweep and way it cuts through the water presents the jig differently, but braid offers you the best feel overall. Map the Bottom – Your first couple of casts should be an exploratory mission, as you decipher clues that are telegraphed back to your rod-hand. Cast out and let the jig settle to bottom. Then slowly drag it back to you, hopping or with mixed-in quicker pulls along the way. You’re actively figuring out substrate at distance, such that you can understand the big picture and where fish will be holding. Like any experiment, start with a “control” retrieve, and compare various types of retrieves thereafter. No Cross-Wind Casting – No matter the orientation of shore or where you’re pitching, wind could be the single largest inhibitor to your catch-total for the day. Position your back to the wind, or directly face it to enjoy far better direct contact with what your jig is doing. Drift into a crosswind, and every fish in the lake could hit your bait on a single retrieve, and you’d never know it because of the huge bow in your line. Wind triggers many fish species up shallow, so on these days, mitigate the effect by keeping your rod-tip close to the water and off to one side of the boat to reduce that problem. Stay Back in Clear Water – Jig fishing can only be productive in the clear shallows when you’re not driving over fish. In hyper-clear water bodies like Mille Lacs, this means fish spook in 10FOW or even more, meaning you have to stay over deep water and simply pitch a little bit further up to the zones you’d like to cover. Fish From the Outside In – When fish are schooled up near cover, it pays to work your casts from the outside in. As you pick off fish after fish from the outside, you have less chance of disturbing an entire school by casting up to the center of the most prime piece of cover. When Vertical, Stay That Way – Vertical jigging works really well in deeper water, but only if you keep your rod tip directly over the top of the bait. Poor boat control when fishing vertically leads to baits off bottom, and less ability to detect bites, especially when the bait is under the boat. Re-Bait – Whether plastics or live-bait, degraded or destroyed additions to a jig hinder the action and direct appeal. 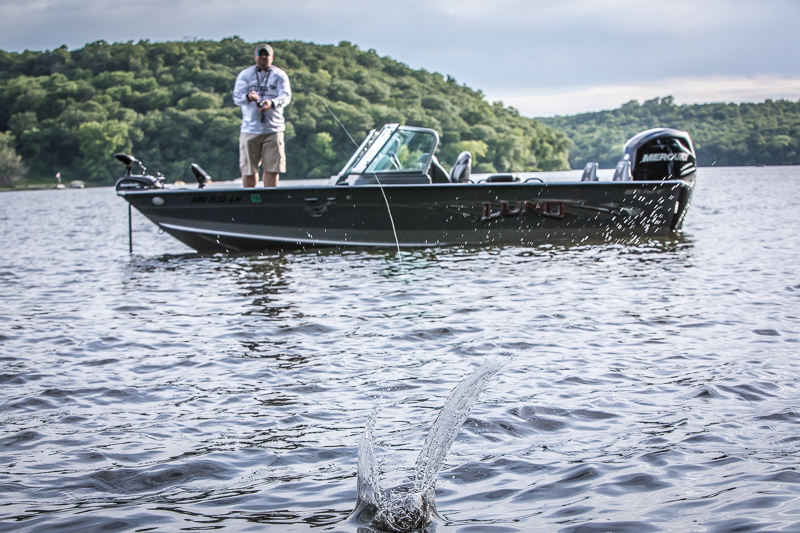 Resist the temptation to leave it on for “one-more-cast” and put your best bait forward. It’s amazing how selective fish can be at times, and at the end of the day you may only use a handful more minnows or plastic grubs. Call that cheap insurance to a successful bite. Focus – Probably the single biggest deterrent to catching fish on a jig is distracted fishing. If you prefer to doze off, drink coffee, or otherwise just relax, start trolling or bobber fishing. The best jig anglers I know are machines. They’re casting, processing bottom content, hooking walleyes, and positioning the boat for the next cast. They’re mentally engaged nearly all of the time, as they pick apart pieces of structure bit-by-bit. While it’s true that the more you pay attention for any fishing scenario, the more you’ll catch, with jig-fishing it’s absolutely critical. Ice-fishing has undergone an interesting transformation in the past few years especially. As social media ice-thickness reports hit the internet by the hour, we get on ice collectively faster than we once did. A legion of mobile ice-anglers get out in their portables sooner than ever, scouring at first the shallows then pushing deep as ice permits. Yet there is a growing group of wheelhouse anglers that fish in comfort weeks and months later, waiting until the ice becomes thick enough to support both truck and drop-down trailer. No matter which group you’re in, eventually you’ll hit the lake in search of fish, and just like in school it pays to do your homework. As ice-anglers, our mobility though better than it’s ever been, is drastically limited by the reality and need to drill a hole in ice to gather information. So why not put in the work when it’s easy? Using electronics from a boat to find fish, and more importantly find areas that will gather fish, is far easier on a 60 degree fall day than a 10 degree winter one. Yet it’s surprising to see so few anglers take advantage of the easy ice-scouting that presents itself in our fall months. In all honesty, I never stop thinking about ice, and no matter when I’m fishing during the open water months, my mind is racing to determine locations that look “fishy” from an ice-angling perspective. Many times, these locations are consistent producers during all months, yet others are specifically good for ice and not during the bulk of the open-water period. The latter types include shallow transitions from mud to sand, or sand to rock, as well as small gravel or rock patches marooned again in shallow weeds or non-like surrounding substrates. Early ice fish push to these places, especially after sundown in clear-water systems. Spots that are no larger than a kitchen table can seem impossible to drill out and find, while they stick out like a sore thumb on a side-scan of any random shoreline. Side-scan technology could be the number one asset to an ice-angler during this time of year, as few things hide from it, even in heavy weed cover or timber. Even if you don’t own this technology, chances are you know someone who does and you could get out for a day on the boat with them. Spend time getting to know the system in either case, and make sure to idle at the proper pace to provide the very best image you can. In general, harder bottom areas show up brighter or “whiter” and soft bottom shows up darker, and aside from timber, fish-cribs, or other sunken gems, you’re looking for any break or transition in the substrate. The more sudden that change is, often the more valuable it can be. For the early ice angler, think first about how you access the water-bodies you like to fish. Chances are, even if you’re walking out on slick-ice that sleds and gear slide neatly over, your spots will be within a ½ mile of your access point. So focus on the areas immediately adjacent to shore that are within a half-mile ice shuffle. Shallow water usually provides the first opportunities to fish on safe ice, so don’t worry about anything more than 15 feet at first. That’s a great starting point, but realize that eventually you may head out with an ATV, snowmobile, or other ice vehicle. As ice-thickness progresses, so too does the season and fishing locations. The first-break off of shore is now another focus area and reason for a completely separate scan. Stay within 100 feet or so of that break and complete another pass or two until you feel you both understand the variation in that break, and identify key points along it that may concentrate fish activity. If you know you won’t be pulling your house onto the lake until vehicle traffic is safe, you’re looking at mid-winter fish locations. Off shore reefs, rock piles, or islands can be key locations to drop a wheelhouse, and are typically well-marked with many of the contour mapping options we have today. That said, the devil’s in the details, and small changes in that structure are readily visible again with side-scan technology. The mistake many ice-anglers make at this point is marking the spot “generally.” Just because you can find the underwater point, or even the spot on the rock-pile where boulders are largest, doesn’t mean you’re located on a part of the structure that gives you the best chance for success. From experience, I can say that this kind of knowledge comes only from scanning it from a boat via multiple angles, dropping waypoints in various locations to pinpoint what you feel is the best location, then following that up on ice with underwater camera work to ensure you’re dropping down on fish. If all of this sounds quite involved for a few fish, I would agree. That said, if you’re the kind of angler that always wonders what they’re biting like “over-there,” you can put much of that uneasiness to rest with a thorough accounting of what you’re looking at well before you drill the first hole of the season. That type of inventory is without a doubt, best done without ice on the lake.